Preheat the oven to 350 degrees F. Wash and trim the root base from the turnips. Line a roasting pan with aluminum foil, covering its edges. 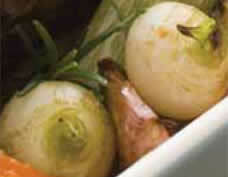 Lay the turnips down, with the stem and leaves folded under the turnip bulb. Drizzle with olive oil and season with salt and pepper. Tightly cover the turnips with more aluminum foil and bake for 30 minutes.